Kazumi Maki in August 1995. "Kazumi got surgery for colon cancer last year and well recovered. He traveled to Romania, Uzbekistan, Germany and Japan. In May of this year, he refused anymore treatment and went to his annual tour to Europe. He was working in Dresden as usual, but on July 26 he became unable to move. Masako brought him back to California on August 10. Just after a month, on September 10, he departed his life. She buried his remains at the same place as his parents on October 15." Kazumi was one of my best friends since my student days at Kyoto University. He became a professor at Tohoku University at the record age of 32 in 1968. In 1974 he went to United States to become a professor at the University of Southern California (USC) College. The USC College News carries an obituary of Kazumi . It begins by these words: "Kazumi Maki, world-renowned physicist in the field of superconductivity, has died. He was 72. Maki was among an elite group of Japanese physicists who during the 20th century fostered the development of physics as a science. He had been a USC College professor of physics and astronomy for 34 years." Pamela Johnson, the author of the obituary, cites the words of Kazumi's colleagues about the speed of his thought, the ability of quick calculation, speaking several languages, devotion to classical music, playing violin, and singing an opera usually in German, sometimes while skipping. Yes! I knew all these features of him since our student days. One thing I did not know is this: "After earning his Ph.D. in physics at Kyoto University, Maki arrived in the United States in the 1960s and worked as a research associate with the famous physicist Yoichiro Nambu at the University of Chicago." This was his career before coming to Tohoku University. Johnson also writes, "Among his many honors were a Fulbright Travel Grant; a Nishina Memorial Prize, given to those who have achieved exceptional results in physics; a Guggenheim fellowship; and an American Physical Society fellowship. Over the years, he also earned a USC Associates Award for Creativity in Research and Scholarship, and an additional major international prize in physics, the John Bardeen Prize, given for theoretical work that provides significant insights on the nature of superconductivity leading to verifiable predictions." Before entering Kyoto University, Kazumi finished technology course of a senior high school in Kyoto by majoring in electrical engineering. This is a rather unusual route to enter a university, but reminds us of the great physicist P. A. M. Dirac's personal history. Dirac graduated in electrical engineering at Bristol University before reading mathematics at Cambridge University . Kazumi's later success in research might have partly come from this similarity to Dirac. At Kyoto University, Kazumi and I were in the same year class until the middle of the third year. He used to take the seat at the center of the first row in every lesson class. I often asked him to teach me about some points I had not understood in our lessons of foreign languages, mathematics, physics and so on; and he never failed to give me clear answers or useful suggestions. Kazumi and I exchanged letters while I spent spring and summer vacations in my home town (Kazumi lived in Kyoto with his parents). In the autumn of our fourth year at the university, he got a disease (meningitis), and could not attend lectures for a few months, so that he graduated from the university one year later than I. In his graduate course, Kazumi studied theoretical nuclear and particle physics under Professors Minoru Kobayashi and Hideki Yukawa. Then he changed his research field to low temperature physics according to the advice of Dr. Toshihiko Tsuneto, who also had studied under Yukawa and been to United States. Thus, Kazumi had quite a broad background of research not restricted within superconductivity. When I was a young researcher at the Radiation Center of Osaka Prefecture, I was a subscriber to the journal Nuclear Science Abstracts. Besides searching papers in the field of my interest in this journal, I often looked for Kazumi's name on the author-index pages, and constantly found his new paper on "dirty superconductors" or something like that. His productive life was good stimulus to me. Kazumi's name first became famous by "Maki term," which reflected the increase in the normal-electron conductivity induced by super conducting fluctuations [4, 5]. Once browsing the index of the book written by Michael Tinkham  at a bookshop, I was surprised to find that his name was cited on pages as many as those that cited the Nobel-Prize winning physicist Lev Landau. I was also glad to find his name just appearing in David Mermin's funny essay . In August 1995, Professor Naoki Toyota, an ex-student of Kazumi's at Tohoku University, invited the latter to deliver a lecture on superconductivity at Osaka Prefecture University (OPU), where I was working. After the lecture, Naoki, a few other members of OPU and I enjoyed talking with Kazumi over beer and sushi dishes. This became my final occasion of seeing him. On his Christmas card to me, Kazumi always wrote about his academic travel of the year to many countries, often with a fancy multi-color pencil. I wish his peaceful rest in heaven. P. J. Johnson, In Memoriam: Kazumi Maki, 72: The award-winning physicist in USC College was a classical music aficionado who played the violin, USC College News (September, 2008). J. Daintith et al. ed., Biographical Encyclopedia of Scientists, 2nd ed., Vol. 1, p. 228 (IOP Publishing, Bristol, 1994). M. Yata, private communication (2008). K. Maki, Prog. Theoret. Phys. (Kyoto) Vol. 39, p. 897; Vol. 40, p. 193 (1968). M. Tinkham, Introduction to Superconductivity (Krieger, 1975); 2nd Edition (Dover, 2004; originally published in 1996). N. D. Mermin, E pluribus boojum: the physicist as neologist, p. 6 in "Boojums All the Way Through" (Cambridge University Press, 1990). The essay was first published in Physics Today, No. 4, p. 46 (1981). I have reminded myself of the fact that at our meeting in 1995 Kazumi told me that he worked under Nambu after finishing graduate courses. This reminding was aided by the memory of my refraining from saying to him at that time, "Then you had no language problems in discussing with the Japanese-born professor." Kazumi was not a person to have any difficulty in speaking in English. Kazumi was awarded Nishina Memorial Prize in 1972 for his theoretical work on superconductors. His winning of John Bardeen Prize 2006 was for his work on gapless quasiparticle excitations due to pair-breaking and for elucidating the role of fluctuations. Nambu’s work and that of Kobayashi and Maskawa have long been known to the physics community to be of the Nobel-Prize quality. So their winning of the prize at the same time is really pleasing. At the press conference of last evening, Maskawa said, “I was delighted when the work by Kobayashi and me was experimentally confirmed, but am not glad that I’ve got the prize.” As a humble scientist, I can well understand his feeling. I wonder one thing about Maskawa. His last name spelled in orthodox romaji (a method of writing Japanese in Roman characters) is Masukawa, but he uses the spelling of Maskawa by leaving out “u” after “s” in his papers. I have had the assumption that he considered the convenience of pronunciation by English speaking people. However, the media reported that he was not good at English. Then he would not have such a consideration as I assumed. Is it that he unintentionally dropped “u” in his first publication, and has continued the same thereafter? The Nobel Prize in Physics 2008, Press Release, Nobelprize.org (October 7, 2008). Scientific Background on the Nobel Prize in Physics 2008: Broken Symmetries, compiled by the Class for Physics of the Royal Swedish Academy of Sciences (October 7, 2008). The Nobel Prize in Physics 2008, Information for the Public, The Royal Swedish Academy of Sciences (2008). Understanding Asymmetrical Universe Garners Nobel Physics Prize for Three Scientists, Inside Science, American Institute of Physics (October 7, 2008). Nambu, Kobayashi and Maskawa Win Physics Nobel, Scientific American (October 7, 2008). Three Physicists Share Nobel Prize, New York Times (October 7, 2008). Particle physicists pick up Nobel Prize, physicsworld.com (October 7, 2008). Nobel Prize in Physics for symmetry breakdown, Nature News (October 7, 2008). Kobayashi-Maskawa paper in PDF (1973). The Nobel Prize in Physics 2008: Speed Read − The Importance of Asymmetry, Nobelprize.org (October 8, 2008). 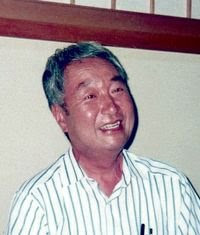 Profile: Yoichiro Nambu in 1995, Scientific American, Scientific American (October 7, 2008). A History of Nobel Physicists from Wartime Japan, Scientific American (October 7, 2008). They planned to publish a set of invited papers in the journal Cognitive Studies at the Japanese Cognitive Society . The theme of the plan was the mirror puzzle, Why left and right are reversed in a mirror? Three authors including me were invited to debate. We wrote papers for three stages: (1) one’s own solution to the puzzle, (2) critiques of the other authors’ solutions, and (3) replies to the other authors’ qritiques. Our situation was similar to the Black Hole War. In our debates, however, I did not find any tone of respect and friendliness in the other authors’ critiques. I say this because they criticized my solution on the basis of complete misunderstanding . Misunderstanding should only come from careless reading of a paper, which in turn happens when one does not pay respect to the paper. You should respect your opponent’s opinion until it is defeated, because the opinion which will lose might be your own. If you kick a strong pole, the thing that is damaged is your foot. A critique in scientists’ war can be scientific and meaningful only when it is based on an accurate understanding of the target of the criticism. Thus my opponents’ critiques were not scientific at all, and I do not think that our debates were fruitful. Highlights: Debates on Mirror Reversal: Why Left and Right are Reversed in a Mirror?, Cognitive Studies, Vol. 15, pp. 496−558 (2008) (in Japanese). Scientific American, Vol. 299, No. 4, p. 82 (2008). L. Susskind, The Black Hole War: My Battle with Stephen Hawking to Make the World Safe for Quantum Mechanics (Little, Brown, 2008). My solution was already published in two parts in refereed journals, so that it does not have any point difficult to understand. Namely, before publication my coauthors and I discussed on some points with referees and editors of the journals, and finally we made them understand our arguments thoroughly to accept our manuscripts. Our publications appeared in: T. Tabata and S. Okuda, Psychonomic Bulletin & Review Vol. 7, pp. 170−173 (2000); H. Yoshimura and T. Tabata, Perception Vol. 36, pp. 1049−1056 (2007). 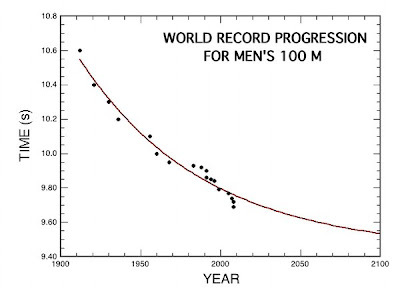 World record progression for men's 100 m. Data, from Re. 1; curve, least-squares fit of exponential function to data. (You can see the real size image by clicking on the image). Jamaican sprinter Usain Bolt won the gold medal for the 100-meter race of the 2008 Olympic Games on Saturday, August 16, establishing the new world record of 9.69 seconds. We find world records for this race since 1912 at the Wikipedia site . A few data points of the latest world records show rapid decrease (see the figure above). This trend seems to defy simple curve fitting. However, I dared to try fitting of an exponential function, y = a + b exp(−cx), to the data. The asymptotic value a, i.e., the limit of the world record, has been found to be 9.43 seconds with a probable error of 0.17 seconds, namely, to lie between 9.26 to 9.60 seconds. During many years, unexpected factors might come to affect the making of records, so that the result of curve fitting should not be much relied upon. A logistic function is useful to model the S-curve of growth . The initial stage of growth is approximately exponential; then, as saturation begins, the growth slows, and at maturity, growth stops. To use this function for the decay phenomenon that reaches a limit, it is necessary to make the function upside-down by making the coefficient in the exponential function negative. Further, one more coefficient should be added to give a finite limit. The function thus obtained has the properties of a slow initial decrease and a final decrease of approximately exponential type. To model a data set without a slow initial decrease, the exponential function of the form I used suffices. 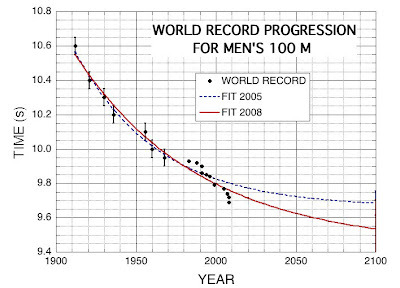 "World record progression 100 metres men," Wikipedia, The Free Encyclopedia (18 August 2008, at 12:42). Kevin Duffy, 100 m sprinting: Is there a limit? (September 21, 2002; last revision, January 15, 2008). "Logistic function," Wikipedia, The Free Encyclopedia (August 11, 2008, at 12:38). The figure shows the energy and number backscattering coefficients of hydrogen ions incident on thick layer of aluminum as a function of incident kinetic energy , and can be used to estimate the backscattering coefficients of antiprotons. (You can see the real size image by clicking on the image). In the previous essay I wrote about the backscattering (also called reflection) of antiprotons from aluminum wall found by Italian physicists. The ratio of the number of backscattered particles to the number of particles incident on a layer of material is called number backscattering coefficient RN. RN of antiprotons are almost the same as that of protons, because the basic formula of the phenomena related to the passage of particles through matter, i.e., the energy loss per unit pass length and the Rutherford scattering cross section, are independent of the sign of the incident particles. Therefore, RN of antiprotons can be estimated by the use of a universal empirical equation we published for RN of light ions, which include the hydrogen ion, i.e., the proton, incident on different absorber materials . The equation for the hydrogen ion incident on the thick aluminum layer is given by the upper curve in the above figure. The energies of the antiprotons referred to by the Italian physicists are from 1 to 10 keV. For these energies, RN of the hydrogen ion and accordingly that of the antiproton can be seen to decrease from about 13%, a considerable fraction, at 1 keV to 2.5% at 10 keV. R. Ito, T. Tabata, N. Itoh, K. Morita, T. Kato and H. Tawara, Data on the backscattering coefficients of light ions from solids (A revision), Institute of Plasma Physics Nagoya University Report IPPJ-AM-41 (1985). The e-mail note for "Physical Review Focus 11 August 2008" carried the news story entitled "Antimatter Bounces off Matter" (online Focus story is given in ). The story tells that in the August Physical Review A, a team of Italian researchers reports that a good fraction of a low energy antimatter beam directed at a normal matter wall will bounce right back. Fans of science fiction know that the meeting of matter and antimatter results in the annihilation of both, accompanied by a release of a tremendous amount of energy. Therefore, the above result, based on a new analysis of 12-year-old data, is reported to be "surprising even to most physicists, though it is explained by basic textbook principles." I have read the full story  and the abstract of the paper  written by the Italian physicists. The antimatter in their experiment was a beam of low energy antiprotons, and they observed a large fraction of the beam was reflected by an aluminum wall at the end of the apparatus. They made a Monte Carlo simulation of the antiproton path in aluminum, and found that the observed reflection occurred primarily via a multiple Rutherford scattering on Al nuclei. The phenomenon is the backscattering of antiprotons from a thick layer of matter. Radiation physicists well know the same phenomenon for the beams of electrons, protons, ions and positrons (note that positrons are the antiparticles of electrons). I'm one of those physicists, and especially studied the backscattering of electrons and ions. Thus the story came as no surprise to me. The abstract concludes with the sentence, "These results contradict the common belief according to which the interactions between matter and antimatter are dominated by the reciprocally destructive phenomenon of annihilation." I would like to say, "It is rather surprising that such a common belief has been held not only by fans of science fiction but also by high-energy physicists." Antiprotons having some energy and passing far from nuclei behave like ordinary particles with a unit negative charge, and suffer the same amount of Rutherford scattering as that protons do; they annihilate with protons only when they come quite close to nuclei. This should be a common belief about antiproton beams instead of the one described by the Italian team. Antimatter Bounces Off Matter, Physical Review Focus, 11 August 2008. A. Bianconi, et al., Experimental evidence of antiproton reflection by a solid surface, Phys. Rev. A Vol. 78 (issue of August 2008). Yesterday I got an e-mail message from the provider of my second Web site to notify the arrival of a comment at the guestbook page. Recently I got only spam comments there. So I opened the provider's page for deleting the guest comment newly arrived. However, I found a good message there. It was from the late Dr. Lewis Spencer's youngest daughter. She found my mention  of her father's passing by Google search, and expressed thanks to me. This was one of the pleasant things of my life these days. As I wrote on the Web page , I saw Dr. Spencer only twice; once in Kyoto, and once at the former National Beureau of Standards, USA. On both of these occasions, however, he was very kind to me. So I'll never forget his hospitality. I also learned much from his excellent publications on the penetration of fast electrons through matter for doing my research work. When I saw him for the first time, I was surprised to find the person who did wonderful calculations did not have one of the arms (possibly it was the right one). I do not know how he lost his arm. Lewis V. Spencer, IDEA & ISAAC Web site (2005).